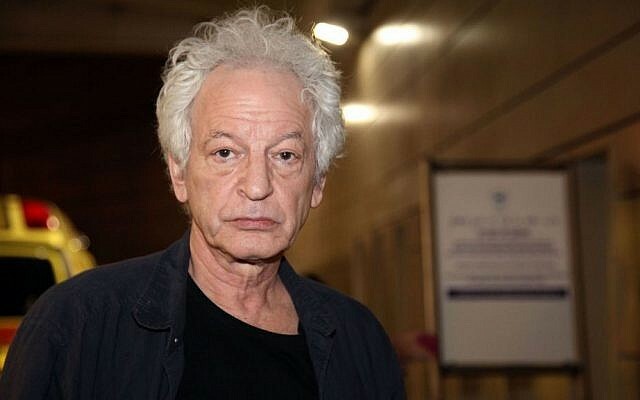 Arik Einstein, the iconic Israeli musician whose songs were acclaimed as the soundtrack of a nation, was laid to rest at the Trumpeldor cemetery in Tel Aviv Wednesday afternoon after his sudden death Tuesday night at the age of 74. 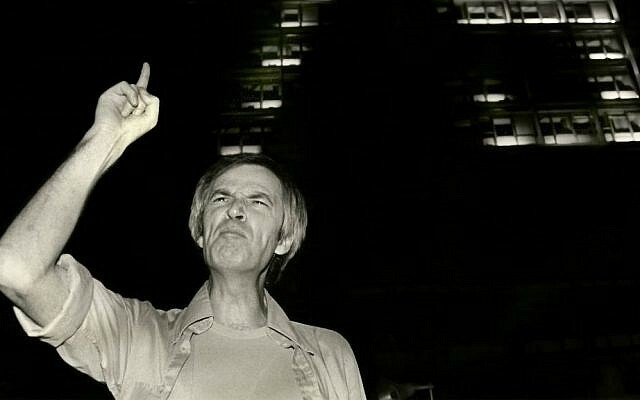 The funeral began at 4 p.m. with the reading of the Kaddish, the Jewish prayer for the dead, as fans gathered on surrounding rooftops to watch the proceedings. Pain and sorrow were evident on the faces of the mourners who remained at the cemetery long after the service, praying, singing, and lighting candles even as the holiday of Hanukkah began with sundown. “You only lived the good, you could not understand the bad,” eulogized his close friend Rabbi Uri Zohar as he choked back his tears. Before Zohar became a rabbi, he and Einstein collaborated on a number of movie projects. 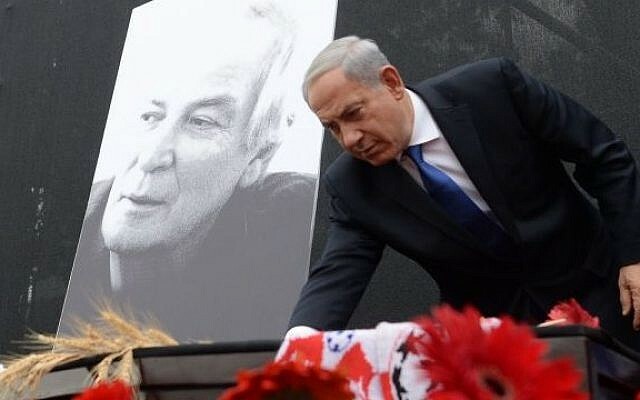 Earlier in the afternoon, thousands of people, including the prime minister, gathered in Tel Aviv to pay their last respects. 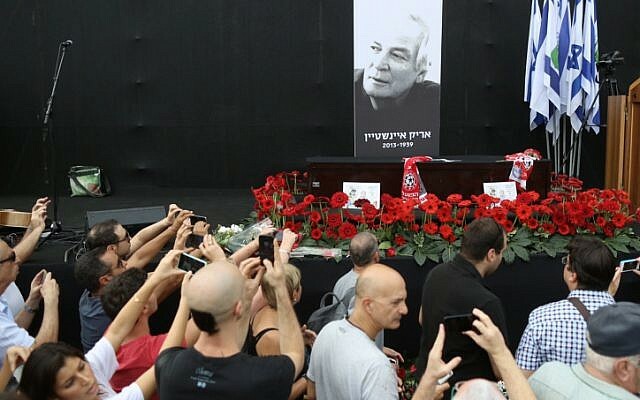 Einstein’s body lay in state in Rabin Square on a platform decked out in mourning black at the center of which his coffin, draped in black, stood surrounded by red flowers. A scarf from the Hapoal Tel Aviv soccer team, of which Einstein was a well-known and dedicated fan, was placed on the coffin. 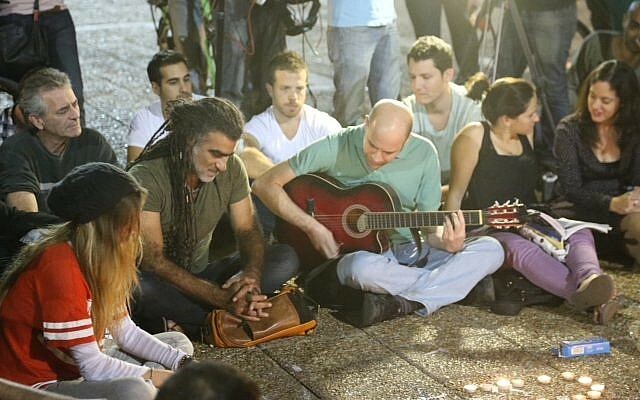 Led by his friend Shalom Hanoch, musicians staged a concert in his memory for the thousnads who had crowded into the square. At about 4 p.m. his body was moved to the city’s Trumpeldor cemetery. As the crowd of mourners swelled, those present joined in singing some of Einstein’s songs. 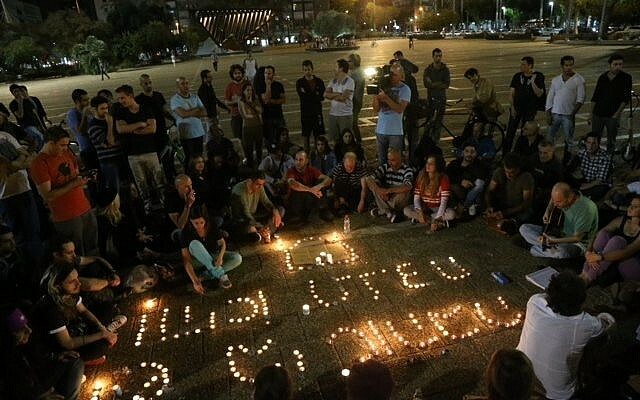 For hours afterwards in Rabin Square, dozens of mainly young Israelis sat amid candles and sang Einstein’s songs. Einstein was rushed to Ichilov hospital at around 10 p.m. Tuesday and died soon after of an aortic aneurysm, doctors said. The death of Einstein, whose career spanned six decades and included 44 albums and hundreds of collaborations, was met with an outpouring of grief. 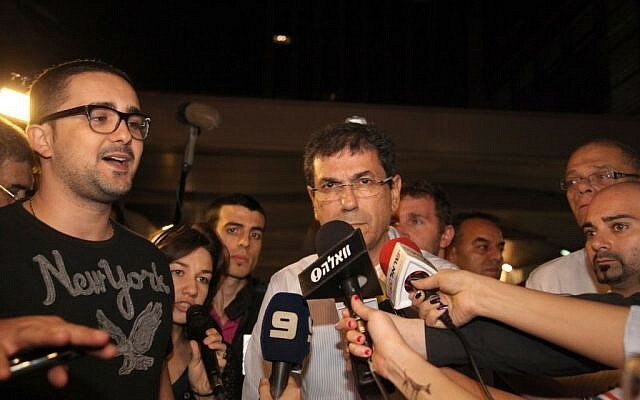 Vigils formed outside Ichilov hospital, on the street below Einstein’s Tel Aviv apartment and at Rabin Square. At his home on Hovevei Zion Street in the city center, some neighbors argued that the spontaneous gathering — including mourning candles and flowers, with passing cars blaring Einstein’s music — was the last thing the very private singer would have wanted. Others spoke of needing to come to the house to show their respect and affection for him. Television channels halted their regular programming to broadcast clips and remembrances of the singer. Radio stations switched to all-Einstein soundtracks. Einstein’s wife, Sima Eliyahu, and close friends, including a number of fellow musicians, were with him at the hospital. 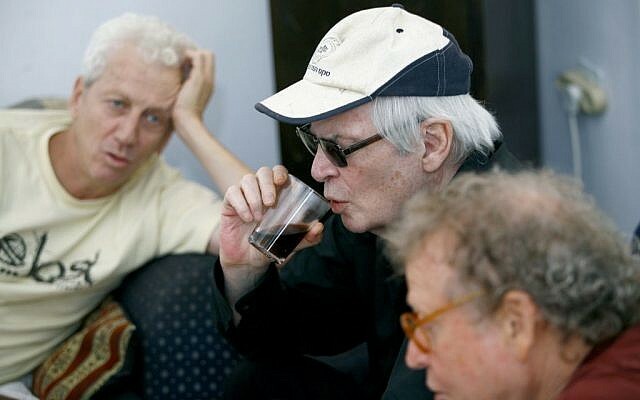 Einstein, born in Tel Aviv in 1939, is considered the godfather of Israeli rock. 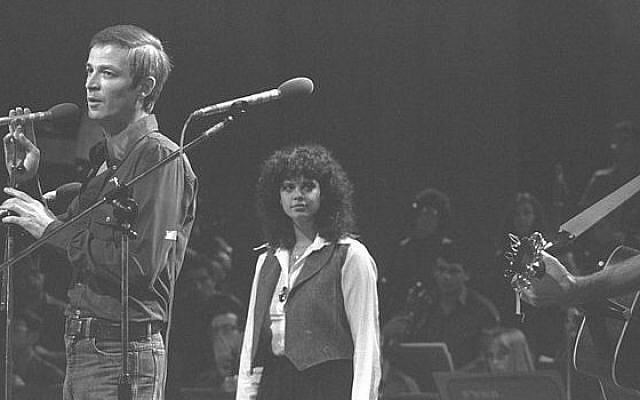 He wrote classics like “Ani Ve’ata” (Me and You), “Uf Gozal” (Fly Little Bird) and “Sa Le’at” (Drive Slow). Einstein had not performed in front of an audience since the early 1980s following a road accident in which he was seriously injured, and he rarely left his home. But he continued to record, had just begun writing a column for the Maariv daily, and was at work on a new album when he died. His first album, “Shar Bishvilech” or “Singing for You,” was released in 1966. He was then part of the rock band The High Windows with Shmulik Kraus and Israeli-American Josie Katz. 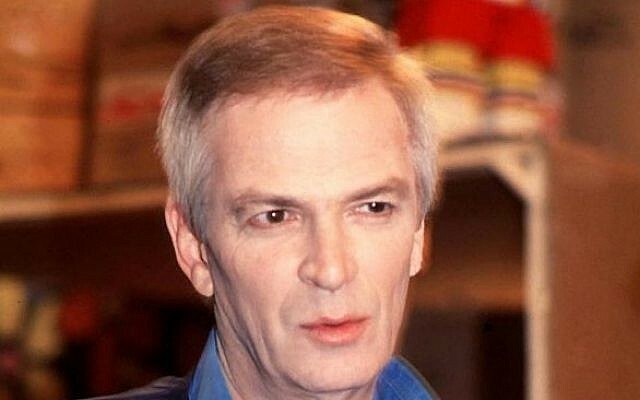 He later formed the Lool, or Chicken Coop, comedy troupe, and excelled as a light comic actor alongside his lifelong friend Uri Zohar. Einstein’s two eldest daughters became Orthodox and married two sons of Zohar, who had also become newly observant. In an indication of Einstein’s across-the-board appeal, several ultra-Orthodox radio stations were also playing his music on Wednesday. A number of commentators noted that Einstein exemplified a number of international superstars, including Bob Dylan, Paul McCartney and Elvis, rolled into one.